October is Breast Cancer Awareness Month, so I thought I would reflect on what I think of when I hear “breast cancer.” Immediately, the word survivor comes to mind. When I see pink ribbons on products in the stores, I think of courageous women and men, young and old, who have battled breast cancer. Together we can fight it, and together we will win! My family was first effected by breast cancer in the 90s, my aunt was diagnosed and continued to live on for 10 years until the disease returned. She was a fighter. She taught me to find a purpose, whatever it is, and live it graciously, with fervor and diligence. She encouraged me to remember to do for others and by doing so, I will be helping myself. She taught me to laugh a lot because humor is medicine to a person’s soul. Breast cancer doesn’t have an age or color, a gender, or religion. It hunts our families, and plagues our hospitals. It wages war in every community and robs us of our loved ones. However together we can tell our friends and family members struggling to overcome that our memories will not be forgotten. We will tell them how much we love them while they are alive, together we can encourage them to continue fighting, together we will find a cure. Join me in going pink: buy products from companies that donate to fund breast cancer research. Many products in stores have the pink ribbon on it to signify that a portion of the sell goes to donating money for breast cancer research. General Mills now has placed pink ribbon on their products, which reflect their partnership to help fight this disease. There is No Purchase necessary to enter this giveaway for a Think Pink Prize Pack. This giveaway will end on October 31, 2011 at 11:59 pm, E.S.T. This giveaway is open the US only! You must be 18 yrs old or older. The winner will have 72 hours to contact me before another winner is selected. Winners are chosen via Randomizer.org and contacted by email. 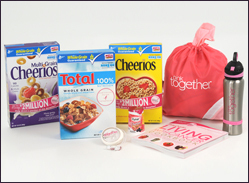 “Disclosure: The PINK TOGETHER prize pack, information, coupons and giveaway have been provided by General Mills through MyBlogSpark. I received the prize pack in exchange for an honest review and opportunity to give my readers this giveaway.